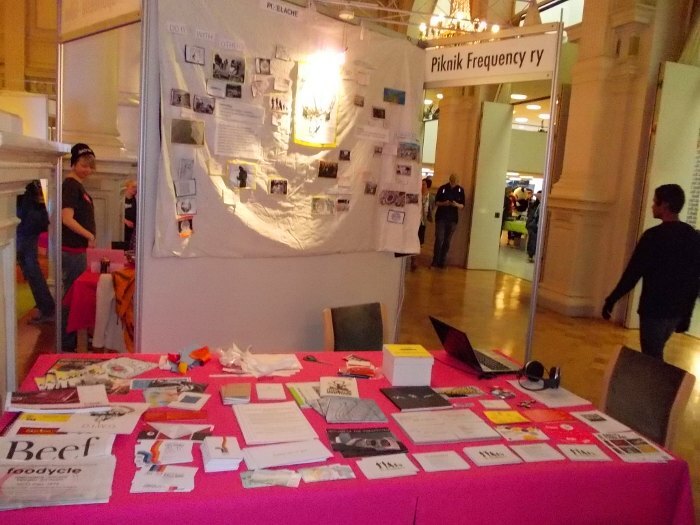 The registered organisation behind Pixelache, Piknik Frequency ry, took part in the RuutiExpo 2013 event, at Kaupungintalo (Helsinki City Hall), now the 3rd time organised by the Youth Department of the City of Helsinki in cooperation with the Educational Department. The event promotes youth empowerment, hosts youth elections, and offers also a space to take part in practical workshops, share opinions, presentations. One of the main purposes of the event is to create discussion forums and candidate positions to bring voice of youth to city decision-makers. Indeed the event organisers say "Come to the venue and find your own way to influence!" - RuutiExpo is free and open to youth of all ages. Ruuti translates into English as gunpowder (or saltpetre, which is also the explosive mixture used in fireworks), and 'naturally' is associated with power or a discharge of energy. This year the event was attended by approximately 4500 people (youth & adults). A large number of city youth services as well as NGOs and associations took part, mostly hosting workshops or presenting messu (fair) -type displays. Piknik Frequency was encouraged to take part for the first time, and had a table in the Toimintatori (Activity-market) among others. As one of the few cultural associations present, the aim of being there was to try raise awareness of Pixelache Helsinki’s Festival, and our outreach & education programme around the year called Pixelversity, as an opportunity for city youth to get involved with experimental art, design, research and activism processes. I (Andrew) acted as Pixelache ambassador for the day, sitting at our stall for almost 8 hours, from 09-17. I have to admit it was my first (and possibly also Piknik Frequency's first) messu/fair -like stall. I had a 2 metre wall, and table of similar length to use. The day before I brought our previous festival flyers, posters and booklets (spanning 10 years), as well as documentations of various exhibition projects, recent project/event information, such as our recent collaborations Foodycle festival and Education Engineering Days. I also gathered some of the leaflets we had in our office 'library-shelf' by some our partners' or guests' materials too, and laid them out on the table. I brought the 'felt-excel' (huopa-taulukkolaskenta/loistaa), and used it as a build-on-the-spot poster. I attached to it some leftover items from recent #eedays usage, and felt-backed cutouts of past posters & logos, photos from our Pixelache 2012 report, links, and quoted basic-description texts about Pixelache in Finnish & English to quickly show-tell passers-by. Honestly, not many people are familiar with our association name high up on the stall (and in the event's publicity), but 'Pixelache' they had heard of a bit more. Out of the steady flow, some groups of teenagers, students and youth-working adults, stopped to ask what we do. I tried to explain with a some words of Finnish, but mostly in English, pointing out to the various elements I gathered. Note: the event is largely a Finnish language event, although being an official city event, Swedish language is officially present too, and many of the attendees spoke English. Maybe because of this, I had quite a bit of interest from exchange students visiting from vocational and university studies, and our stall --with a lot of English language materials-- caught the attention of, for example, Spanish, French and Albanian visitors. What items disappeared from the table the fastest? A sure-smile hit was Tuomo Tammenpää's ChompSnakeOrigami (see video demo) which served also as our Camp Pixelache 2012 D.I.W.O. info-flyer & related badges -- all were gone! (not so surprisingly). Interestingly, the single copies of each Festival 2005, 2006 & 2007 publication all were lifted at once--in a sort of targeted pass+grab action--into one guy's backpack! I returned a few handfuls less of our Pixelversity flyers, but other things which were popular: Kaupunkiverstas flyers, and colourful squares of HyperIsland stickers (that just read 'HI'). Furthermore, I gave out a few of the Suomenlinna Money Lab project-end letters that were hand-posted to island residents, including one given to Nuorten Ääni project representatives (who also got a copy of Tech Tools for Activism booklet). I also gifted away a copy of our Afropixel partners' Rose Des Vents Numériques book (2012) & Shaina Anand and Ashok Sukumaran's Anisotropics exhibition catalogue (2010) to representatives of Nuorten Muslimit ry. In the process, I also encouraged some new participants to Trashlab, and one or two who'd like to get involved in other things. My personal favourite from the other 'toimintatori' stalls (in terms of mixing participatory method & agenda) was that of Nuorten Akatemia, who, thanks to Tea Tönnov & Jonas Svensson, members of Ilmari project, offered a workshop for youth to make Ilmastomeemit (Climate Memes). Using online platforms such as Meme Generator and Imgflip, the results are collected in their FB page album. I appreciated reconnecting with Tea, and her work connecting NGO-agenda based work (in this case on environmental & climate changes issues) with youth groups. Nuorten Akatemia facilitate the insertion of workshops by associations and other groups into high-school environments, creating a platform for teachers to learn about what non-profit groups are doing education-wise, and vice-versa, for associations to connect with teachers who are interested to invite groups into (school) youth environments. It reminded me that the same can be said for RuutiExpo, being a platform for NGOs and associations to connect with Helsinki City youth services. My experience as an artist and activist in Helsinki (outside Pixelache activity) is that it can be difficult to get involved on a regular basis with projects within schools and Nuorisotalot (youth houses) if one is not an official staff member. I recognise that sometimes the issues I have faced are funding and language limitations, but there is also not an obvious pathway to get involved, beyond personal and often temporary initiatives. I look forward to discussions in the future with city youth service staff and decision-makers about how cultural associations such as ours --Piknik Frequency (Pixelache)-- as well as other peer associations within our networks, for example, M-Cult and Alternative Party from the digital/network culture scene. Thankful for the invitation on this occasion, I return from my experience with some questions: How can we contribute in the future to Ruuti -type youth programmes over a longer period than the Expo? How can the city facilitate more exchange of skills and experience between the official and informal learning/culture environments? How can we (ideally cultural associations in cooperation with city youth services) develop participatory, culture+agenda -led programmes with and for youth?